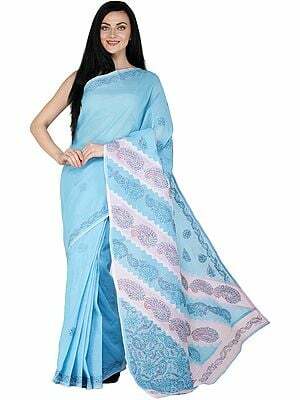 Chikan Saris in muslin or malmal fabric are mostly appreciated, yet they are found in a wide range of fabric such as cotton, georgette, chiffon and even crepe. The origin of Chikankari work can be traced in the gullies of Lucknow, Uttar Pradesh. The literal meaning of the word Chikan is embroidered fabric and has been derived from the Persian word ‘Chikin.’ And, this style of delicate handwork is believed to have been presented by Nur Jahan, the wife of the Mughal ruler Jahangir. Authentic chikan work of finest quality can be seen at the Chowk, Lucknow, from where it is delivered all over the world. Though it is considered to have taken birth in Lucknow, yet it is a bit masked with mystery. Many historians claim that chikankari is a Persian art which was brought to India during the rule of Mughal Emperor Jahangir by his beautiful and artistic wife Mehrunissa. She was an excellent embroiderer and had a passion to craft charming floral thread art of different patterns to impress the King. And, gradually with time it attained royal patronage. The alluring art that Meherunnisa brought with her from Persia slowly became very popular with the king and the people of the kingdom. Practice and training workshops were conducted later to spread this art among people. Originally the gorgeous Chikankari embroidery was done on the finest Daccai Mulmuls which is otherwise known as Muslin cloth. This was done with the appropriateness of dealing with the hot and tepid climate of regions in Delhi and Lucknow. And, muslin clothes were preferred over all other types of fabric for comfort and relaxation. This is even depicted in historical fine arts and miniatures of the Mughal emperors that show them wrapped in fabulous white loose muslin garments. It is stated in books that after the fall of Mughal kingship, the chikan artisans and craftsmen got dispersed in different places across India. This is what led to the flourishing of Chikankari work in West Bengal, specifically Calcutta. 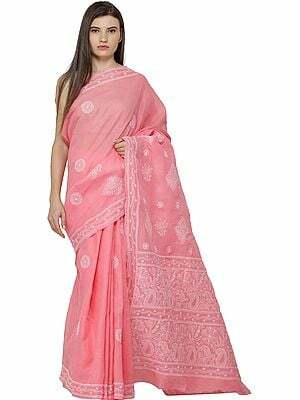 Everywhere the craftsmen adopted the same traditional method of crafting delicate floral patterns in malmal or muslin cloth and have kept the art alive till today. Today, Chikankari is an art that is practised by home-based craftsmen and mainly executed by female artisans. The designs are first traced on the fabric using some washable pencil colours and then worked upon to bring life to these imprints on fabric using white thread and needle. And, it lures people of all cultures. Different types of stitching patterns are adopted to add vogue to the Chikan clothes. The basic things that alter the designs from one another are the thickness of the thread and points at which the needle is dipped in and taken out from the fabric. The different patterns of stitches that add beauty to the embroidery are backstitch, and hem stitch. You can see the work in jail form, shadow pattern and around 30 plus stitching patterns like Zanjeera, banarasi, rahet, kahatu etc. 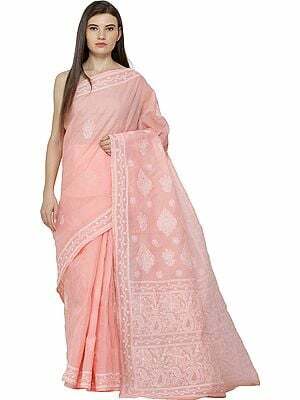 Lucknowi chikankari saris are beautifully crafted with Chikan embroidery all over the body with white pretty flowers and leaf designs made with delicate needle and thread work. 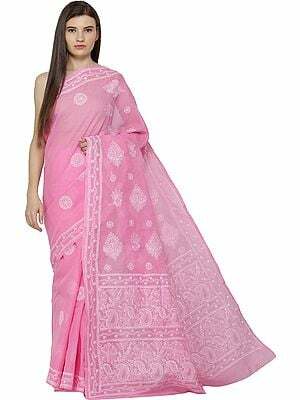 It is praiseworthy that the style and designs of chikan saris has remained so original and traditional at the same time from generation to generation. The blend of traditional Chikan work with contemporary designs over a wide variety of fabric such as georgette, cotton, chiffon etc. 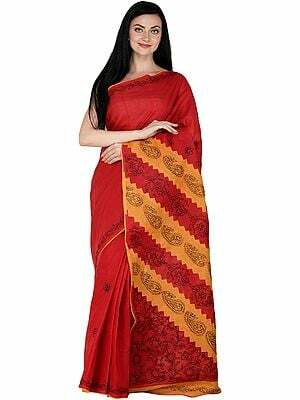 is offering utmost charm and grace to Chikan saris these days.